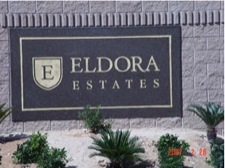 Custom exterior monument signs in a variety of styles; sandblasted- stone, wood, marble, granite with metal lettering. Monuments give a powerful first impression of your development and are easy to recognize with your brand name or logo. Contact us for your monument sign. We build custom monument signs for residential communities, Apartments, business buildings, golf courses, and retail complexes. We know the elements unique to Nevada's desert climate and what materials to use ensuring your signs, monuments, foam or metal letters look as good as the day we made them for as long as you need them.